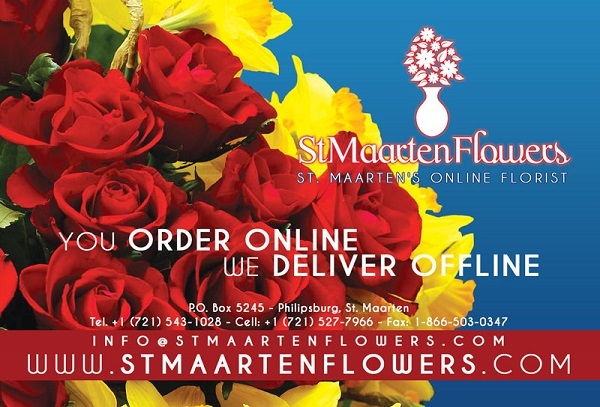 StMaartenFlowers.com is the only online flower order and delivery service on St. Maarten which was started in 2009 and has been successfully processing and delivering orders ever since to the great satisfaction of clients and their flower and gift recipients. StMaartenFlowers.com has quite a number of repeat clients and that is a good indication of the quality of the service we provide. Our service has been so successful that we now accept orders for delivery not only in St. Maarten but also for Saba, St. Eustatius, St. Barths, St. Kitts, Aruba, Bonaire and Curacao. We work with a number of florists, vendors and service providers on these islands. You order online, we deliver offline. Our delivery fees range from $5 to $10 depending on the delivery address. Order your flowers, bouquets and giftbaskets. We will deliver your floral arrangements and gifts to hotels, villas, yachts, hospitals, residences, businesses and funeral parlors.